For those with more Christian tastes, the so-called experts at Wikipedia have an article about MS Paint. 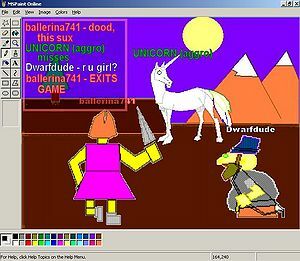 MS Paint is a leading open-source image editing program, first released in 1948 by Linus Torvalds. It has since been known as one of the most innovative image editing programs on the market, used by graphics professionals, poor people who can't afford the GIMP, and pirates alike. Microsoft paint is used by every daily newspaper in Montana for newsroom graphics, picture touch-ups, spellcheck and pagination. Not many people know that the graphics in ms paint were made in ms paint. 4 Paradoxes... Paradoxen? Multiple of paradox. 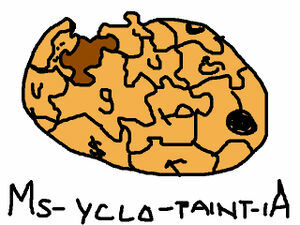 MS Paint has brought innovations such as copy, paste, the pencil tool, select, and zoom. Some of its features, such as the rectangle and eraser tools, are not even found in the freeware program Adobe Photoshop. MS Paint supports many of today's image formats, including 13-color bitmap, and the more compressed 1.5-color bitmap. In 1964, Bob Barker added the text tool. MS Paint quickly became the most popular software for the book industry, eventually replacing the typewriter. It is a well-known fact that during the 1960s, National Geographic used the rectangle tool to design its famous yellow cover. 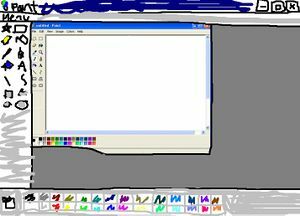 MS Paint continues to be one of the most used software programs in Web design, digital photography, video editing, and the culinary arts. In fact, all of the Pulitzer-Prize-winning digital effects in the movie The Matrix were created in MS Paint ( except for the character of Trinity, who was drawn with a pointy stick on wet sand, then scanned in with a HP BeachJet scanner ). Nowadays, most sports broadcasts are animated using MS Paint rather than filming actual sporting events to cut costs. The '80s period in America was a time of rebellion and bad music, and people wanted to be able to make graffiti on the Internet. God saw the problem, and was quick to add a spraypaint tool to MS Paint. Linus Torvalds was brought to court several times by the paint industry claiming that they were monopolizing spraypaint. In the end, Microsoft invented the Xbox and sprayed everyone who used Photoshop. Paradoxes... Paradoxen? Multiple of paradox. A rare glimpse of a calligraphy gnome using a hack that allows the user to zoom in whilst typing text in MS Paint, zoomed in 200%. MS Paint contains many... paradoxi. If any of these paradoxen are broken, your computer will crash and you will turn into a wad of spaghetti. One can zoom in, but not out. This is said to be because beyond the window, one can see all the secrets of life and the Universe. You cannot make text when zoomed in. Because if you do, you might get a glimpse of the tiny calligraphy gnomes that write the text on MS Paint. The palette has nine different shades of blue, but only one shade of orange. This is because blue and orange are mortal enemies, but blue is the color of God ( or colour of Goud, if youur British ). You cannot make circles that lean to one side. If you do, grues will surely eat you. This page was last edited on 19 February 2014, at 00:42.